Ah, there’s nothing quite like the smell of nuclear material wafting on the ocean breeze. Here in New California, the residents don’t let attacks by irradiated creatures and folks duking it out in power armor stop them from enjoying the post-nuclear landscape. They’re drawn by a bit more than just ocean views and radiation as far as the eye can see, of course. There’s also plenty of loot to be had by survivors intrepid enough to look for it. 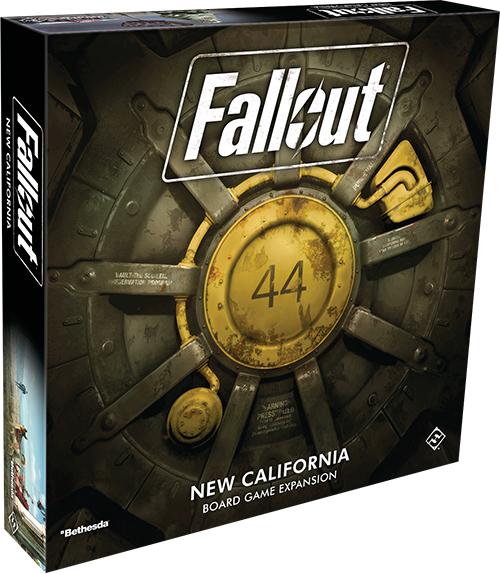 Thus far, we’ve taken a look at several aspects of the New California expansion for Fallout: The Board Game, starting with the survivors who call this desolate corner of the wasteland home. Then, we moved on to how these survivors can come together to tackle a brand new cooperative scenario. Now it’s time to get to the good stuff: the loot! The old world may have been destroyed when the bombs dropped, but there are still plenty of pieces lying about. 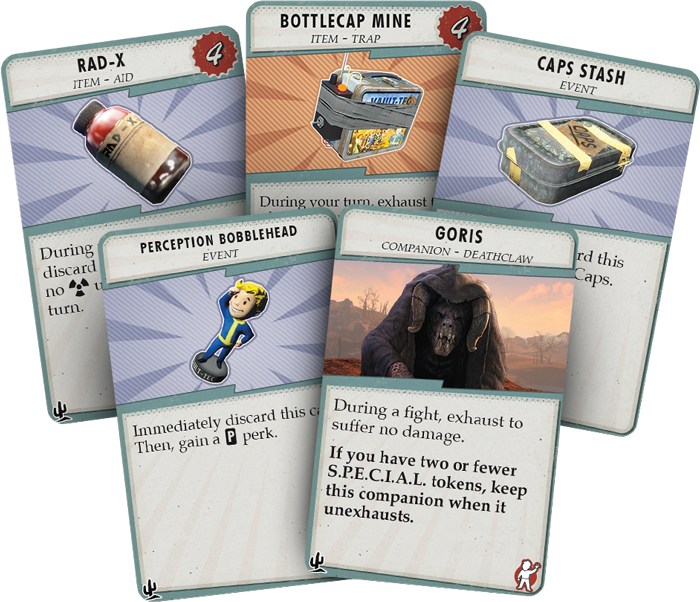 The wasteland is positively littered with valuable loot that can be had by anyone bold—or foolish—enough to scour the irradiated wastes. You, too, can get in on the action, collecting cool new gadgets or sweet memorabilia to round out your collection by completing quests and defeating monsters. 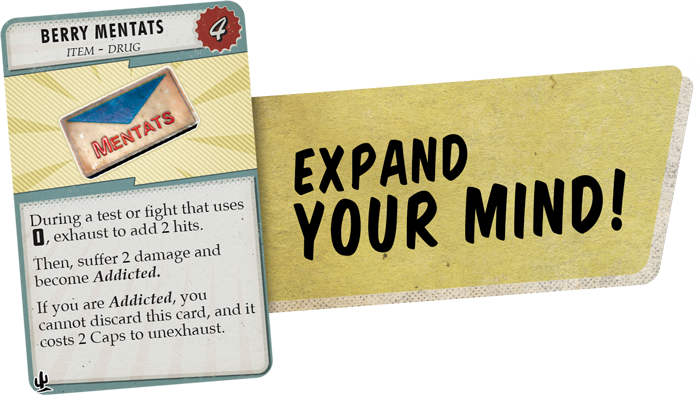 To that end, New California adds 26 new loot cards to your potential haul. 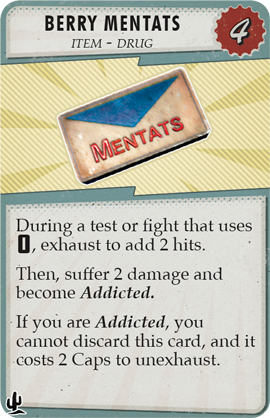 Mentats can increase your performance, sure, but you’ll need the Aid other items provide just to survive on your own. 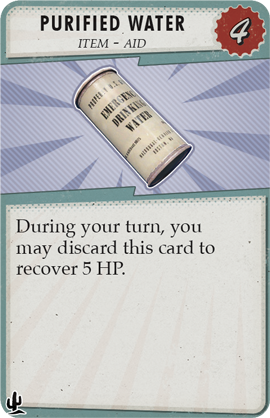 Despite the ocean stretching far off into the distance, potable water is hard to find anywhere in New California, and we wouldn’t blame you for being a bit wary of drinking the questionable stuff found in the base game. Luckily, now you have a good chance of stumbling across some Purified Water. Same great taste, 100% less radiation! 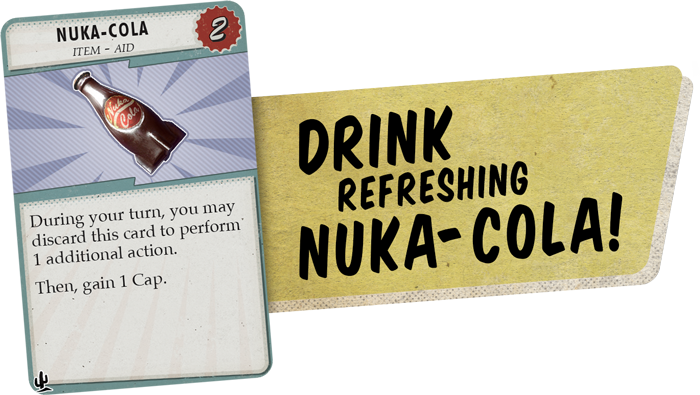 Water is fine and all, but sometimes you need something with a little more flavor, and what’s better than a crisp and refreshing Nuka-Cola? 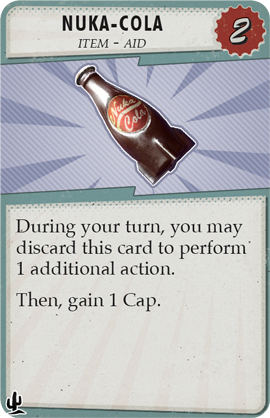 Taking a swig of one of these will give you the energy you need to take an extra action on your turn. Plus, you get a free Cap in the deal! Who could say no to that? 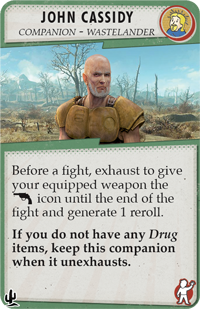 Let’s be honest, a lot of the stuff you’ll find in the wasteland is Junk. 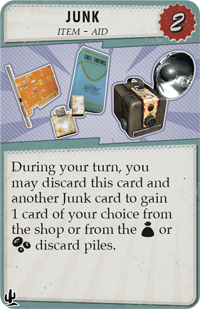 Even junk has its uses, of course, and some things that don’t appear useful can actually be very beneficial to you. For instance, some survivors might find collecting bobbleheads pointless. 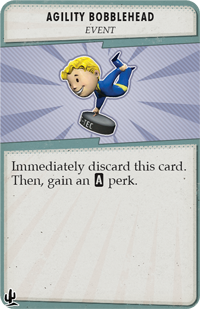 For the discerning collector, however, one of these little guys, such as the Agility Bobblehead, can have many perks. What’s good loot if you don’t have any friends to share it with? 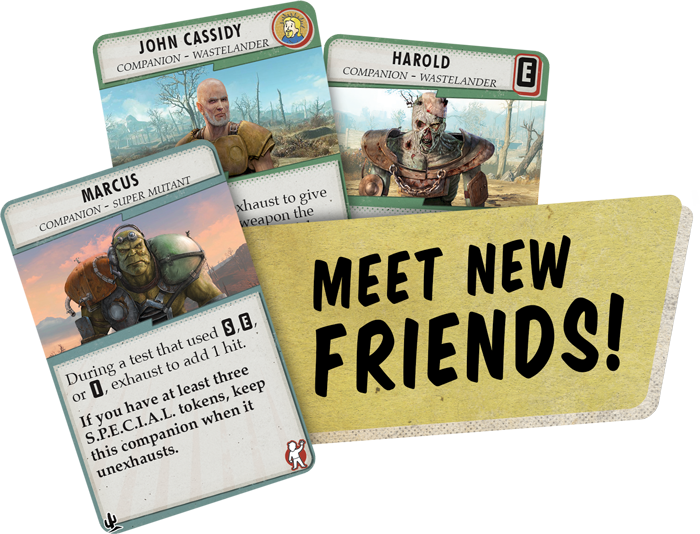 Whether you purchase their services from the shop or stumble across them while out looting the wasteland, New California also introduces several new Companions that can join you on your adventures along the golden coast. Let’s be honest, you’re not going to use a lot of the stuff you find during your adventures. Why lug it around when you can sell it for some easy Caps? During these times, it can be especially useful to have Harold traveling with you. 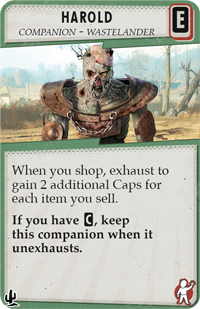 He may be a hideous mutant with a tree growing out of his head, but he can also help you gain two additional Caps for each item you sell. Seems worth it to us. 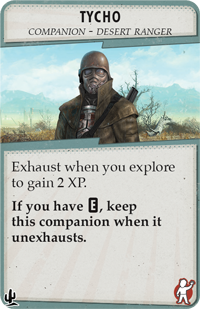 With all the dangers present in the wastes, it’s hard to find anyone who has survived long enough to tell their tale. When you come across someone like Tycho, then, it’s in your best interest to listen to what they have to say. 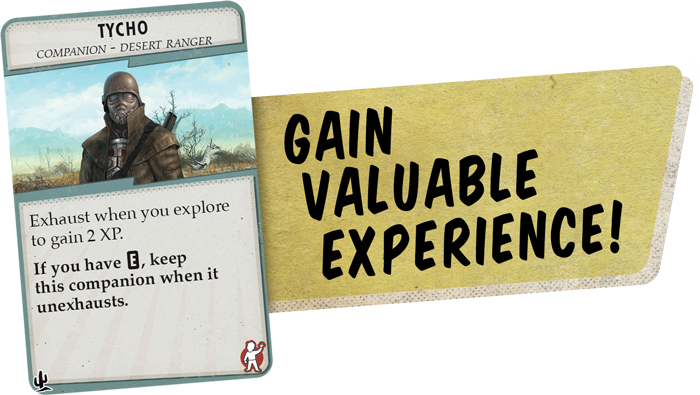 As a member of the venerable Desert Rangers, he carries vast knowledge of life in the wasteland and can slowly dispense that knowledge to you, granting you two XP every time you use him while exploring. Experience will only take you so far, though. Eventually, you’ll have to put that knowledge to the test in your own encounters, and having someone at your side who knows how to fight can be the difference between living to fight Super Mutants another day and becoming a Rad Scorpion’s lunch. If you’re charismatic enough, Ian will act as your personal bodyguard, lowering an enemy’s level by one before a fight. 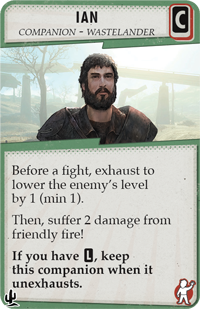 Unfortunately for you, though, he’s not always the best at distinguishing between friend and foe and will also deal you two damage from friendly fire whenever he’s used! If you’re looking for some who won’t mistake you for a bloatfly, you can try to convince John Cassidy to join you. He’ll give your equipped weapon the ranged icon and generate a reroll before a fight even begins. But you’d better stay clean if you want him to stick around. Not only do you need to be idolized for him to even agree to come with you, he’ll leave you on your own if you have any Drug items when he unexhausts. New California may never return to its former glory, but that doesn't mean it's totally devoid of useful supplies. If you look in the right places—and with the right people—you'll find plenty of good stuff just below the soft radioactive glow of the surface. Find some new friends, dive in, and grab all the loot you can find! Look for New California (ZX03) at your local retailer in the fourth quarter of 2018. You can pre-order your copy at your local retailer or through our website here!